Domaine Gentaz-Dervieux remains a famous, no, make that legendary name among older Cote Rotie collectors. The domaine no longer exists. But fortunately there are a few scant, remaining bottles that can be found that are the best reminder of the wines that were produced here. Domaine Gentaz Dervieux was perhaps the first estate to bottle their own wine. This took place when the property was owned by Jean Dervieux, the grandfather of Albert Dervieux. Marius Gentaz was a true legend in Cote Rotie. He began working 1.52 hectares of vines with his father in 1952. By 1965, Marius Gentaz was in charge of the domaine. The name of the winery was a combination of the Gentaz family name and that of his brother in law, Albert Dervieux. Today, the few remaining bottles are testaments to Marius Gentaz as well as impossible to find and shockingly expensive! To offer a point of reference, with only a few bottles remaining that are most often sold through auction, Domaine Gentaz-Dervieux is now perhaps the most expensive Rhone wine in the world, with single bottles from the best vintages often selling for close to $2,000! 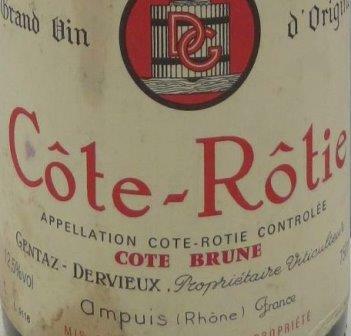 With old Syrah vines of close to 60 years of age located on the Cote Brune, Domaine Gentaz Dervieux only produced one Cote Rotie wine, although it changed names, or at least labels adding the word Cote Brune to the end of the name. The vines were ideally located on the steep, terraced, hillside terroir, with most of the vines being in the La Landonne lieu-dit. They also had vines planted on the Cote Brune and in the Vialliere lieu-dit. There most prized vines were perhaps quite close to where Guigal grows the grapes they use for La Turque. In fact, in the believe it or not section, Marius Gentaz was the first person that was offered the rights to buy the vines for what became La Turque from M. Battier of Vidal Fleury back in 1980. Marius Gentaz declined, as he already had his hands full and wines were really not selling that well in those days. You probably already know the rest of the story. The parcel was quickly sold to Ets. Guigal. It is amazing when you think about it. Gentaz Dervieux passed on owning the parcels used for what became La Turque, and they also sold a small parcel of vines they owned that was used to produce their La Cote Blonde. That parcel is where Guigal gets their fruit to produce La Mouline! Traditional in every sense of the word, Marius Gentaz preferred to harvest early in the morning, as the cold air naturally chilled the grapes, helping to retard oxidation. At Domaine Gentaz-Dervieux, the wine was vinified without destemming in cement vats. The press wine was added soon after it had finished fermenting, and the juice with the recently blended in press wine was aged in only, used oak barrels for between 18 to 24 months. When I say old barrels, while they certainly varied in age, it’s rumored that some barrels were at least 100 years of age! The wines were bottled by hand, which could lead to potential bottle variation. Marius Gentaz retired in 1993. As his daughters were not interested in the wine business, Marius began to rent his Northern Rhone vines owned by Domaine Gentaz-Dervieux to his son in law, Rene Rostaing in that same year. Marius Gentaz passed away in 2011. The vineyards of Domaine Gentaz-Dervieux were eventually integrated into Rene Rostaing. As all the bottles left are fully mature, or past their prime, a simple splash decant to remove the sediment and wake the wine up is all that is needed. Domaine Gentaz Dervieux is best served at 15.5 degrees Celsius, 60 degrees Fahrenheit. The cool, almost cellar temperature gives the wine more freshness and lift. Domaine Gentaz Dervieux is best served with all types of classic meat dishes, veal, pork, beef, lamb, duck, game, roast chicken, roasted, braised and grilled dishes. Domaine Gentaz Dervieux is also good with Asian dishes, hearty fish courses like tuna, mushrooms and pasta. Fresh kirsch, pepper, herbs, strawberry, bacon fat and earthy scents filled your glass. Medium bodied, bright and fresh, this fully mature wine ends with a mouthful of lively cherries.